Quilted thermo fleece jacket by FUCHS & SCHMITT: stylish and wonderfully warm in down look made of microfibre in up-to-date colours. In order to emulate the typical down look, the filling is made of an innovate, feather-light thermo-fleece filling: it is very warm and breathable as well as water- and windproof. Figure-flattering cut with dividing seams for an attractive silhouette. 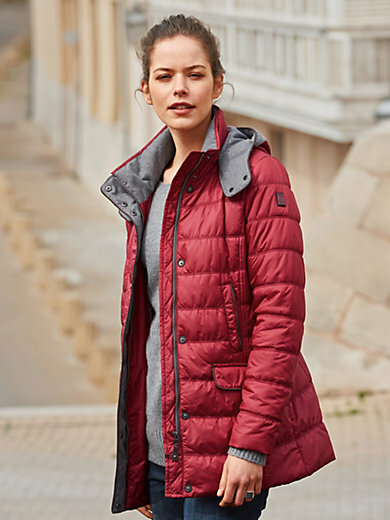 With high-closing stand-up collar, detach­able hood with drawstring and toggles, concealed zip fastener and press stud front and elegant contrasting facing in the hood, press stud front and collar. 2 zipped seam pockets with flap, 2 welt pockets with press stud fastening and a zipped inside pocket. Outer fabric, facing and filling made of 100% polyester. Lining in 100% nylon. Sleeve lining 100% polyester. Length approx. 30ins. The fleece jacket is machine washable.